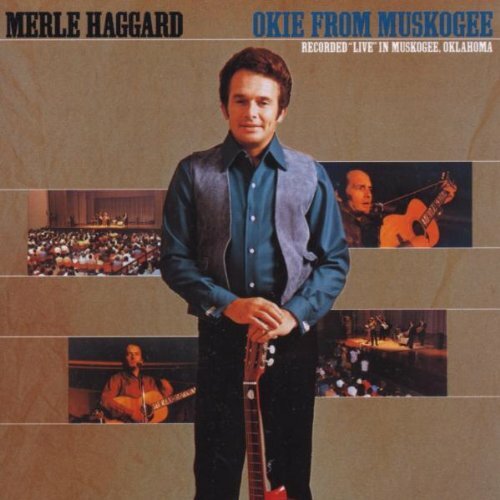 Merle Haggard and the Strangers’ original release of the of “Okie From Muskogee” was December of 1969. The album went on to win the Academy of Country Music award for Album of the Year and Single of the Year for the Roy Edward Burris co-written ode to small town pride, “Okie from Muskogee.” The album was recorded live in Muskogee, Oklahoma and has been re-released in 1992, 1996, 1997, 2005, and 2006. You can add 2014 to that list. Hear an up-tempo live version of Haggard’s ‘I Take a Lot of Pride In What I Am’ below. “Fightin’ Side Of Me” has been re-issued on CD – by BGO Records (UK) as part of a two-fer paired with Hag’s duet “Just Between The Two Of Us” with Bonnie Owens in 2004. This forthcoming re-release will be its debut as both a digitally remastered and as a single stand alone CD.